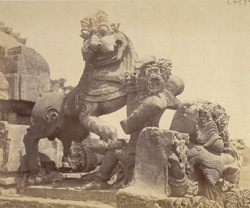 Photograph of the Hoysala sculpture on the Kedareshvara Temple, Balagamve [Balligave] taken by Henry Cousens c.1880s. Balligave is located in the modern state of Karnataka. Although it is now a tiny village, the temples and other remains found there attest to the fact that it was once an important town. The Kedareshvara Temple dates from the 11th Century and consists of three shrines arranged around a large open hall. Two of these shrines contain lingas, one of which represents Brahma, the other Shiva. The third shrine houses a statue of Vishnu. The temple is beautifully decorated, the ceiling depicts Shiva and Dikpalas whilst serpents adorn the screens. This is a view of the sculpture of the Hoysala king in combat with the lion, situated on the top of the main shrine of the Kedareshvara Temple (11th Century) at Balligave.